Improvements in file opening and saving are always great improvements to see. Thanks a lot for your encouraging words! Performance is one area I just can’t turn my back on. So I’m really glad to have finally taken care of this long standing issue. Tested your test on 4.0 and it took 74 seconds on my little bit older PC (without any other task on PC running at the same time – checked Windows Task Manager). So you got to run this test on some recent computer. Could you write some PC specifications you run tests on. 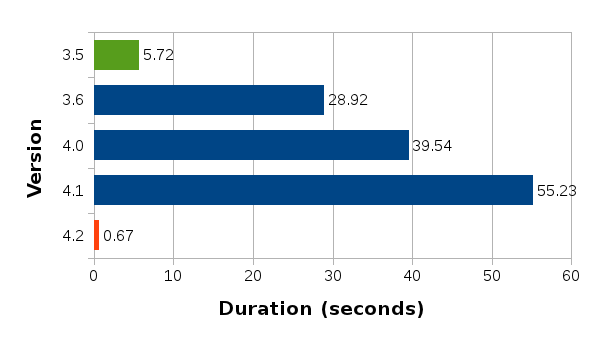 Yes, I know this… I just looked at the graph v4.0 were is 39 seconds and compared to my v4.0 were is 74. So I am comparing the same version of software, so wondering what was the PC the test were run on. I use a machine with quad core Intel Xeon clocked at 2.53GHz, with 12 GB of RAM. No SSD, just a conventional spinning hard drive. Thank you for the great work. I just got bitten by this bug today and am happy I could download a nighty. On OS X, there is a significant improvement with the nighty. Save times went down from around 10 to only 2 minutes. The first 85% of the progress bar is completed withing a second but then the last part still takes minutes. If you are interested, I could share with you my data. It is semi-confidential and as it contains email addresses I do not want to disclose it on any public forum. It would be great if you could somehow anonymize your document and file a bugzilla report. If it’s just email addresses, it should be possible to scramble them somehow. The easiest way is to use Find & Replace and just changing one letter by one letter. E.g. change a for x, i for w, o for f etc. Doing this multiple times and mails will look masked. Just don’t disclose the algorithm you have used, because of possible reverse engineering. … But this was not the topic of this blog post. Would you share some details about how you did this? Bad algorithm? Memory issues? Thanks! I would say both. The algorithm was not optimal, plus it was doing too many memory allocations and deallocations that were entirely unnecessary. The whole design of the code in question was not architected with performance in mind. I guess the same holds true for #fdo30770? Windows 8.1 / Office 2013 user here. I keep a tab on open-source software because change may be coming. Also, I often install LO on family and friends’ computers. I read the release notes for version 4.2 and wanted to thank you for your many contributions. Thanks to you, and all the other volunteers, LO is making strides! Keep it up!